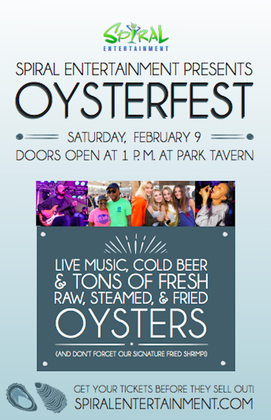 It's time to get shucked up once again with Atlanta's Best Oysterfest! We've got it all! This is the only Oysterfest where you can get steamed, fried, and raw oysters. Not an oyster fan? We've got delicious fried shrimp and fried chicken! Full bar featuring delicious cold beer and signature cocktails. We have tons of TVs to show the days best sporting events including NCAA basketball. We've got the best green space in all of Atlanta in Piedmont Park to eat, drink, and take in the Atlanta Skyline. Tons of indoor and outdoor space. If it's cold, the heat will be on. If it's warm, it will all be open air. Zack Falls will be spinning all day! Event is 21 & up. Ticket price includes admission and entertainment. Food and drink are extra. Cash at door only! We will have ATMs. Drink and food are purchased using ticket system onsite. Unused tickets may be refunded. Buy more tickets, get a discount.